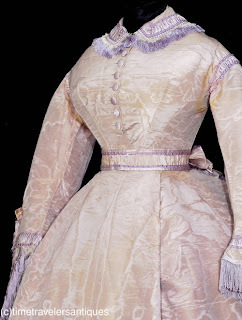 A very romantic original circa 1867 lady's lilac colored fully trained silk taffeta three piece gown with a very pronounced and well matched moire' pattern. A lined and stayed bodice with self fabric buttons to the front closure, an ornate pleated silk satin and fringed gimp collar, with trim that repeats on the armscyes, and elaborate bowed and fringed cuffs to the modified pagoda sleeves. 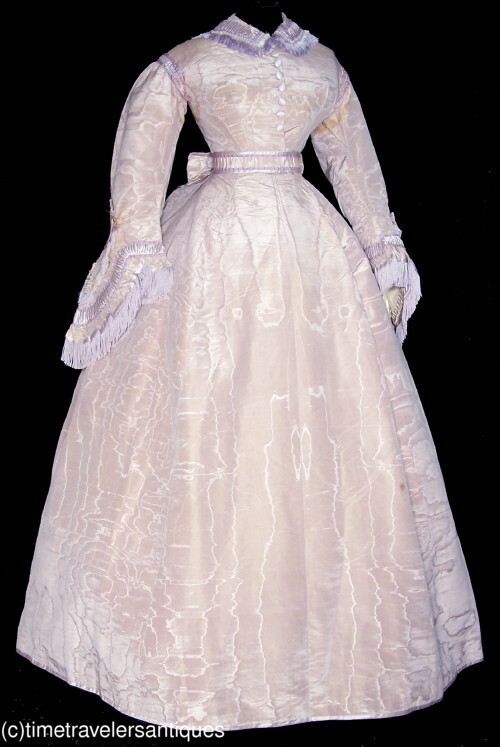 A separate matching waist sash with a back bow with decorative buckle and a three part split tail. 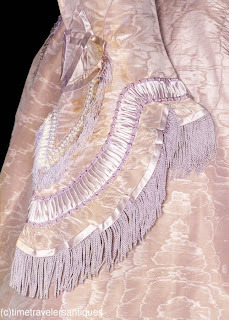 A gored front and a cartridge pleated back to the unlined skirt with a transitional bustle, a deep crinoline faced hem, and a silk satin floor brush. 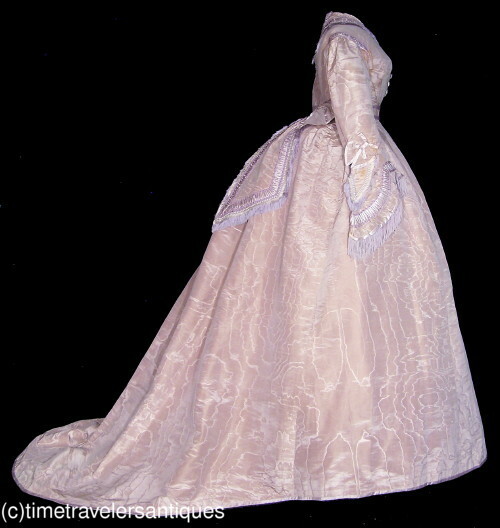 Shown over a hoop skirt and foundation that are not included. 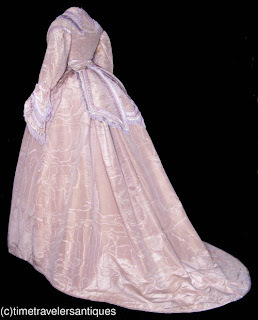 18" from shoulder to shoulder, a 36" bust, 24" waist, and 59" from shoulder to front hem. In very nice clean presentable sound as found condition, with one missing button at the bottom of the bodice, some wear to the collar's trim at the back crease, underarm perspiration as shown, some wear to the gimp at the armscyes, two 3/4" surface slits at one armscye, some organic spots to one sleeve, some minor perspiration and a partial reinforcement to the waistband at the back, a few spots to the underside of the train, three small spots at the tail of the train, and a few pin dot age flaws. 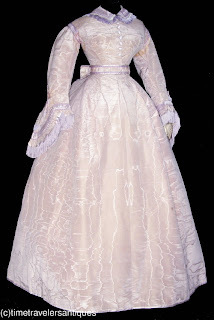 All is reflected in the reserve price for this striking post Civil War transitional special occasion gown. I dunna think it means what you think it means..
Kimono style Teens Era Coat by Worth! Lady Mary, eat your heart out! Oh my! A very silly looking 1830's bonnet.